This Sunday, the #SundaySupper is proud to partner with the prestigious family of Chantal to create awareness in Breast Cancer. We join to millions of people working every day trying to find the cure for breast cancer, one of the biggest causes of death in women at this time I feel so honored to be part of this incredible event. It is important for us to raise awareness and invite all women to perform personal self-exam, so simple that you can do it yourself in the comfort of your home. This monthly checks are so important they have saved millions of lives worldwide. There are millions of testimonies of success thanks to all of the effort of those who work with this cause without rest, we also want to give you the opportunity to contribute to this amazing cause by buying products like this Easy as Pie Dish by Chantal. Amazing quality and incredible product. Chantal is offering a 20% discount for purchasing theirs newest addition to the ceramic dish categoric this beautiful and practical easy as pie dish that you will find in a variety of colors. 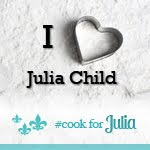 The promotion code is BAKE4CURE and also I invite you to explore all the beautiful products that they offer on the website. Collaborate and also enjoy a high quality product. 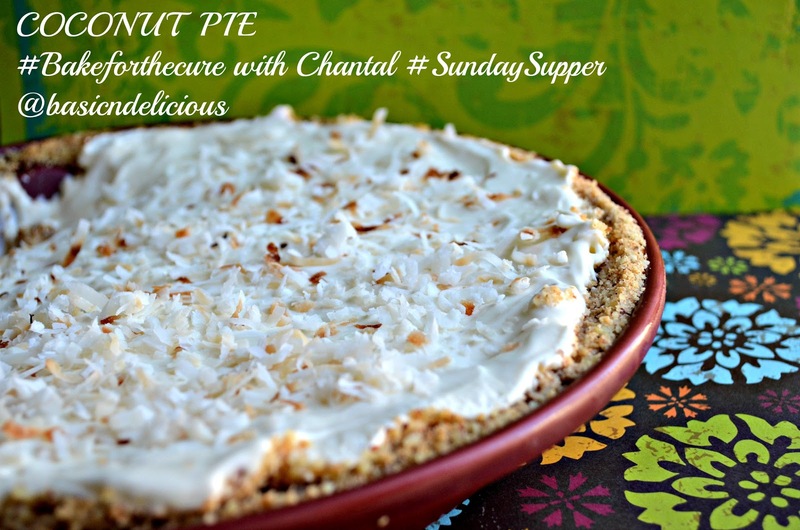 I also want to inspire you with this delicious Coconut Pie that I made using my Chantal Easy as Pie Dish. Here is the direct link to the website where you will find this beautiful dish. Keep up with the latest from Chantal on their website, twitter, facebook, and Pinterest. 1. Mix butter with crackers and almonds until it forms a paste, spread on your Easy as Pie Dish by Chantal cookware and bake for 10 minutes at 350 degrees F.
2. In a blender place the coconut milk, milk, egg yolks, condensed milk and cornstarch, blend and place in a saucepan over low heat, stirring constantly until thickened about 20 minutes altogether add the vanilla and the coconut extract. 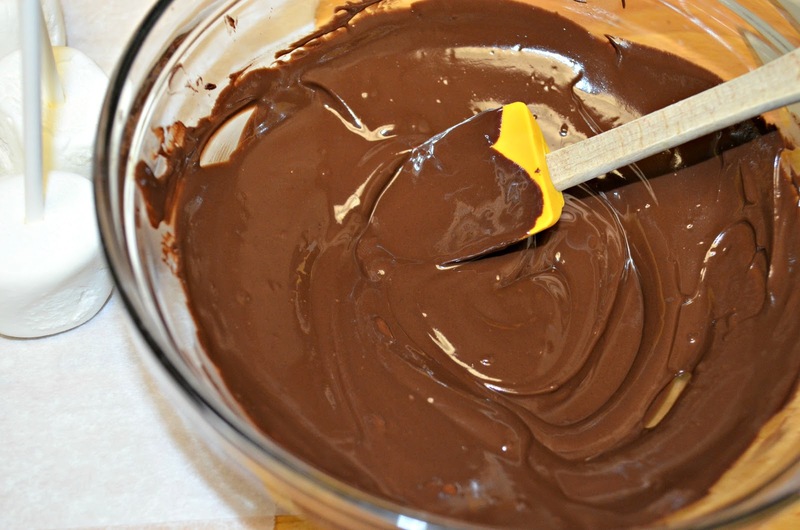 Once ready, remove from heat, place in a bowl and cover with plastic wrap, refrigerate for 3 hours. 3. Whip the heavy cream with 4 tablespoons powdered sugar until it forms whipped cream, stir in the coconut cream and place on the cookie base and almonds. Freeze for 2 hours. 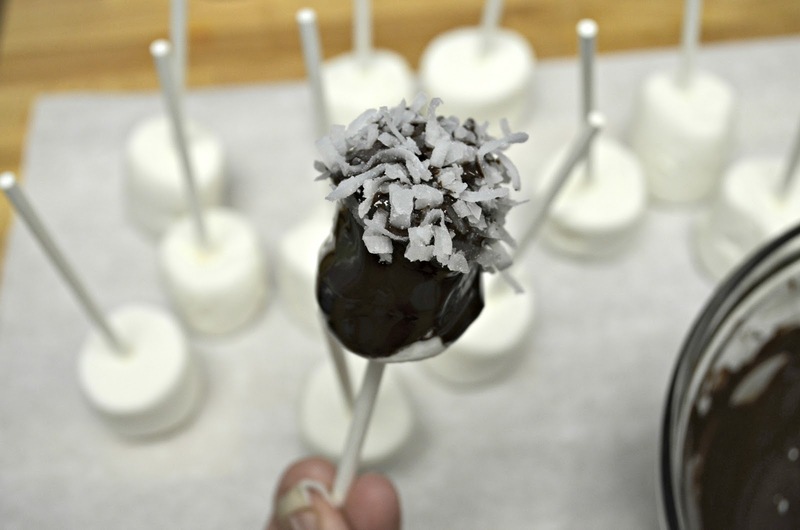 Before serving, sprinkle the toasted coconut. We have more delicious recipes to inspired you from many of us who are giving away the dish and the pie to cheer someone else. Check out this additional recipes. Do you want to get your own Easy as Pie Dish? Chantal is offering will be 20% OFF of ALL Chantal Pie dishes on www.chantal.com. BAKE4CURE must be entered at checkout to receive the pie dish discount. 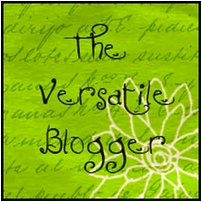 The coupon discount code is active October 16 2012 through October 30, 2012. The Sunday Supper Team and Chantal Cookware, would be honored to have you join us for this special #BakeForACure event Around the Family Table this week. Join us on Twitter throughout the day during #SundaySupper. 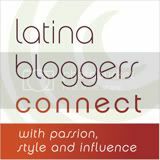 We’ll be meeting up at 4:00 pm(PT) for our weekly #SundaySupper live chat. This is one of the favorite times of all children and many adults too, nothing better than Halloween. Many usually go to some activity or party, and on this occasion I want to give you a different idea and very easy to do, to share with friends. 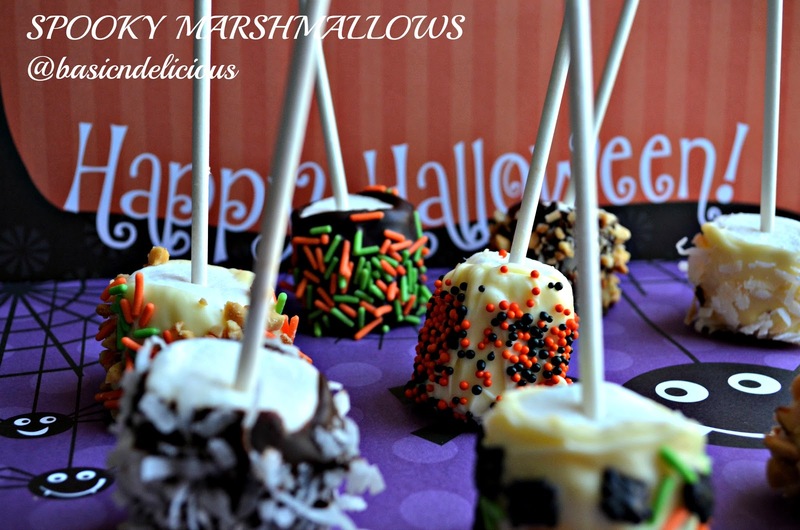 These delicious marshmallows will be the sensation of Halloween night between young and old. Also if you wish you can decorate and give as gifts at the end of the day. Enjoy this day and give away homemade candy. Place the semisweet chocolate and white chocolate in 2 bowls, place to melt in the microwave in 30 second intervals, stirring each time, until melted, about 3 times each of the chocolates. Place a popsicle stick in the center of each marshmallow. 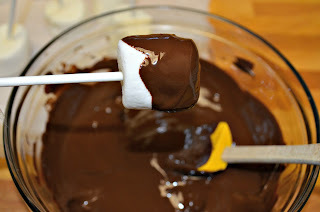 Pour the chocolate over the marshmallow and sprinkle with the topping. Place on a tray lined with parchment paper and refrigerate for 10 minutes. This recipe makes 24 marshmallows decorated. Deliciosa idea para disfrutar en la celebration de Halloween, en la cual tratamos de cambiar la forma en la regalamos dulces. 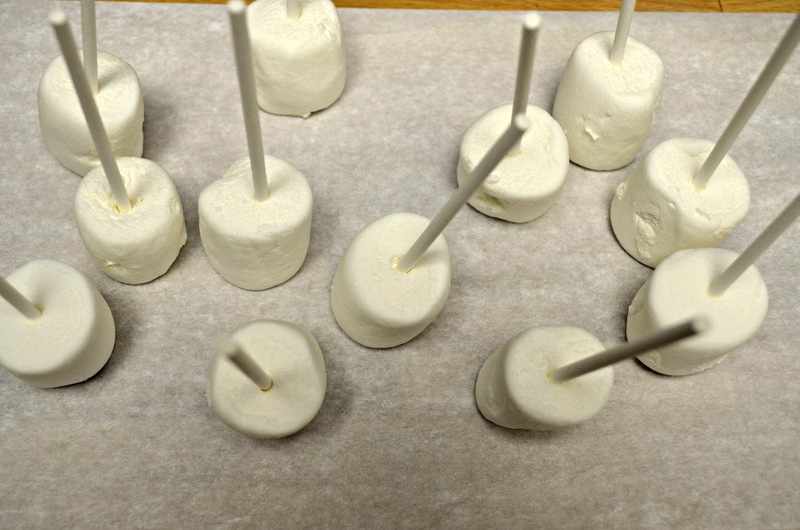 Estos marshmallows diferentes y deliciosos son la opción perfecta para llevar a una fiesta o incluso si los decora puede darlos como regalo al final del día. Así que disfrute de esta receta súper practica y para ese día en el que lo único que hacemos es pensar en chocolate y mas chocolate. Coloque el chocolate semidulce y el chocolate blanco en 2 tazones, para derretir coloque en el microondas en intervalos de 30 segundos, revolviendo cada vez, hasta que derrita, aproximadamente 3 veces cada uno de los chocolates. Coloque un palito de paleta en el centro de cada marshmallow. Vierta el chocolate sobre el marshmallow y rocie con el topping. Coloque en una bandeja forrada con papel encerado y refrigere por 10 minutos. De esta receta salen 24 masrhmallows decorados. One of the things I enjoy most during this time is to make comfort foods, those that will come to the soul when you eat. And so on this occasion I want to give you this recipe that has been in my family for decades is part of the menu in this cold season in which you just want to eat under the covers. Definitely there is nothing better than that way, is simply delicious. 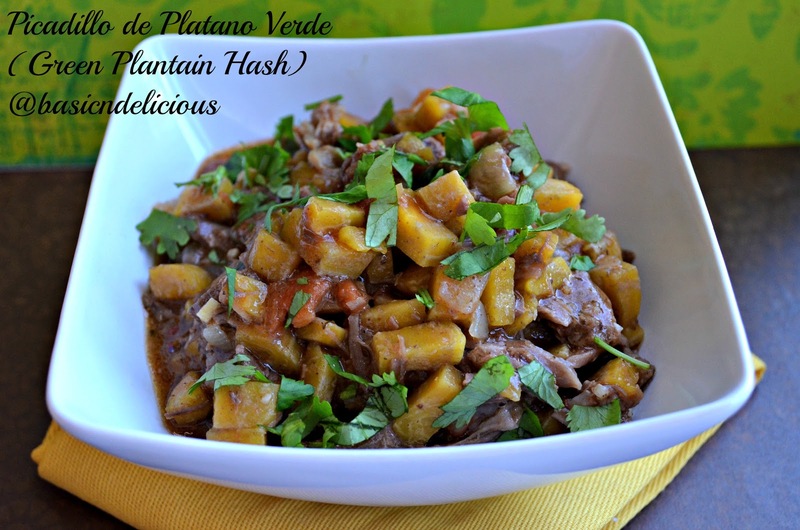 I know this recipe is a bit unusual to some, but I assure you will be surprised when you prepare and try as it is incredibly delicious, and gives you a different option to use green plantains. 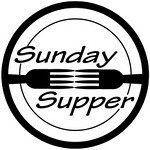 Part of what we do this week is to invite you to be transported to a warm and comforting, for this reason the #SundaySupper family has prepared for you a large number of recipes to enjoy at this time. 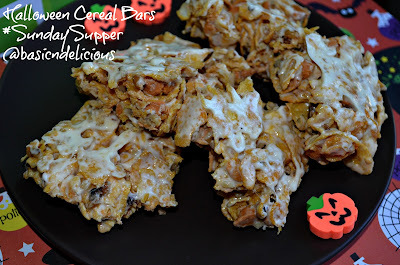 I encourage you to bring your blankets to enjoy these delicious recipes. 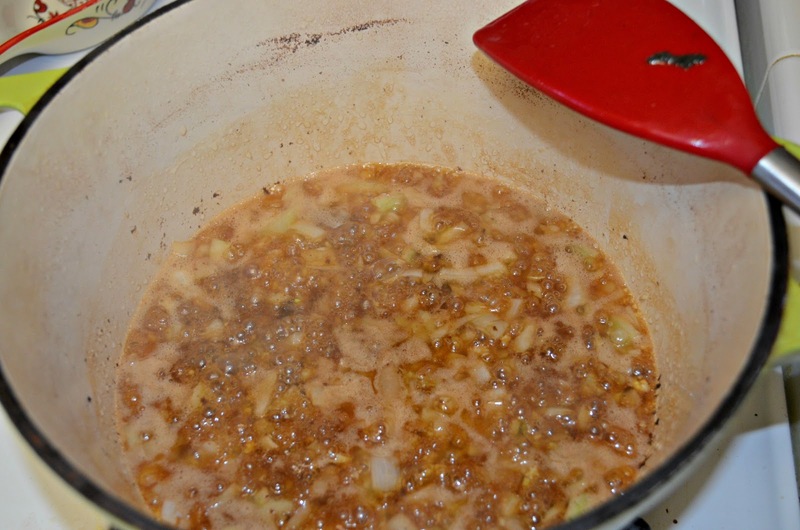 In a heavy-bottomed pot place the ribs with 4 cups of beef broth and cook for about 3 hours on medium heat. Once the ribs ready, remove from the pot and place in a bowl, remove the bone and shred the meat. In the pot where you cook the meat, add onion, garlic and can of tomato, let it cook for five minutes, add the 2 cups of leftover broth and simmer over low heat, add the green plantain and meat, stir well, season with cumin, oregano, Worcestershire sauce, salt and pepper to taste. Place the lid on the pot and let it cook for 20 minutes over low heat, stirring occasionally. Once ready, add the cilantro and serve accompanied with white rice and salad. Una de las cosas que mas disfruto en esta época es hacer comidas reconfortantes, esas que te llegan hasta el alma cuando las comes. Y por eso en esta ocasión quiero regalarles esta receta que ha estado en mi familia por décadas forma parte del menú en esta época fría en la uno lo único que desea es comer debajo de las cobijas. Definitivamente no existe nada mejor que eso y el que me diga que no pues se pierde de algo muy delicioso. Se que esta receta es un poco inusual para algunos, pero les aseguro que se van a sorprender cuando la hagan y prueben ya que es increíblemente deliciosa, y les da una opción diferente para utilizar el plátano verde. En una olla de fondo grueso coloque las costillas con 4 tazas de caldo de res y cocine por aproximadamente 3 horas a fuego medio. Una vez cocinas las costillas, saque de la olla y coloque en un tazón, retire el hueso desmenuce la carne. 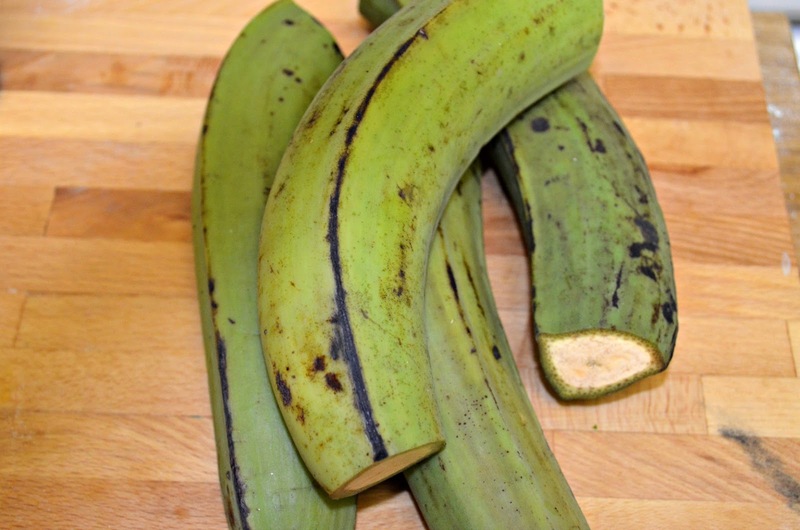 En la olla donde cocino la carne, agregue la cebolla, el ajo y la lata de tomate, deje que se cocine por cinco minutos, agregue las 2 tazas de caldo que sobran y deje hervir a fuego bajo, agregue el platano verde y la carne, revuelva bien, sazone con el comino, oregano, salsa lizano, sal y pimienta al gusto. Coloque la tapa a la olla y deje que se cocine por 20 minutos a fuego bajo, revolviendo de vez en cuando. Una vez listo, agregue el cilantro sirva y acompañe con arroz blanco y ensalada. And if you want more inspiration, here are even more delicious recipes. We would be honored to have you join us on Twitter throughout the day during #SundaySupper. We’ll be meeting up at 4:00 pm(PT) for our weekly #SundaySupper live chat where we’ll talk about our favorite Comfort Food Recipes.